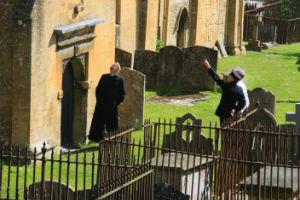 In 2012 the BBC made an initial series of Father Brown, based on G. K. Chesterton’s fictional detective, using Blockley church and vicarage as their location. With a worldwide audience, the programme has been a great success, and brings visitors from around the globe to our church and village. 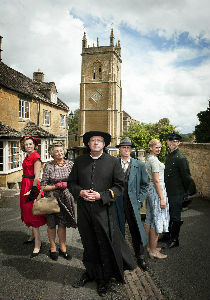 Father Brown has now completed five series, filmed in the Church and in and around Blockley and other local villages. A seventh series starts filming in early summer. 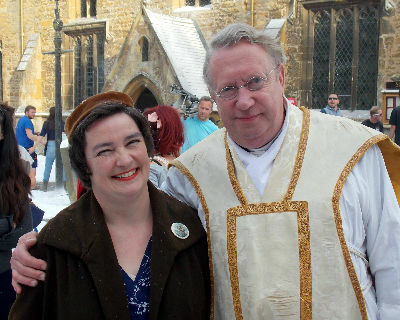 Dana, our Vicar also made her mark by being included in scenes as an 'extra'. Father Brown appeared most delighted with her performance! To raise funds for the upkeep of the church, some very attractive Father Brown memorabilia has been created using original artwork by our very own Barbara Dunn. A fine bone china mug, a greeting card, a jute shopping bag and a linen teatowel are all on sale at Blockley Shop. All make ideal presents or souvenirs and provide much needed funds for the church.